Oil paint and canvas are my primary media but I also make videos and I draw rather compulsively on a wide variety of surfaces. 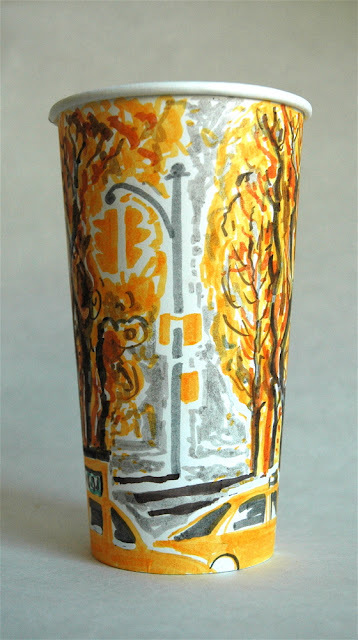 My drawing surface of choice since 2008 is the paper takeout coffee cup. The slightly off-white, matte surface of a sturdy unadorned paper cup takes beautifully the jet-black India ink and the earthy permanent colors of the Faber and Castell colored brush pens that I favor. This coffee cup thing started at my part-time job three or four years ago when Styrofoam coffee cups were gone one day, replaced by these pristine white paper cups. An idle moment, a sharpened #2 pencil and the obsession was born. A stint of jury duty in the City some months later led to the elaboration of my technique with art pen and brush pens. 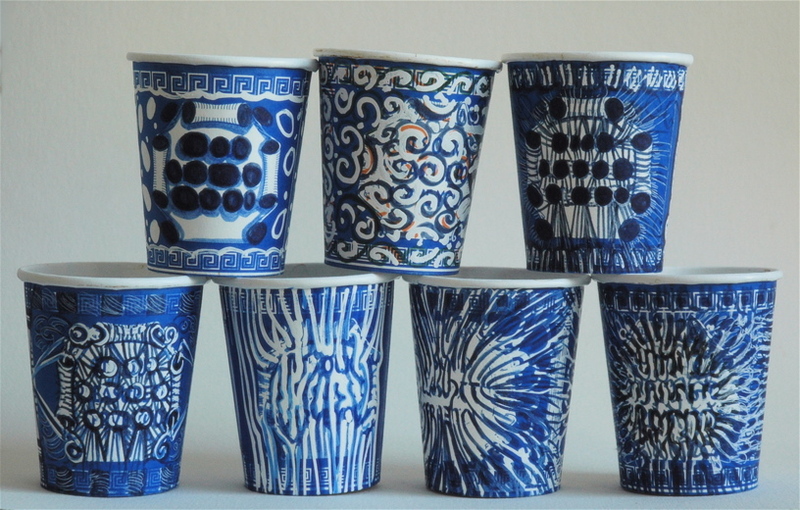 I now save the cups from the drinks I buy and occasionally collect them from other artists with whom I meet for tea or coffee around town. I wash and dry them and record on the bottom the date, place and occasion, as well as the drink that was consumed, thus capturing the social moment just passed. White cups are still my preference, but my eyes have been opened to the possibilities of colored surfaces and odd printed designs that I alter with ink drawing or sometimes paint over with gouache or oils, letting the cup color show through the finished piece. In this blog I am documenting the intersection of art-making and art-seeing, daily life in New York City and cardboard coffee cups. I blog about life with my two daughters in the city, exhibitions we go to, artists I meet and things I am working on in the studio. For my stories about art and life, "cup in hand" click here. 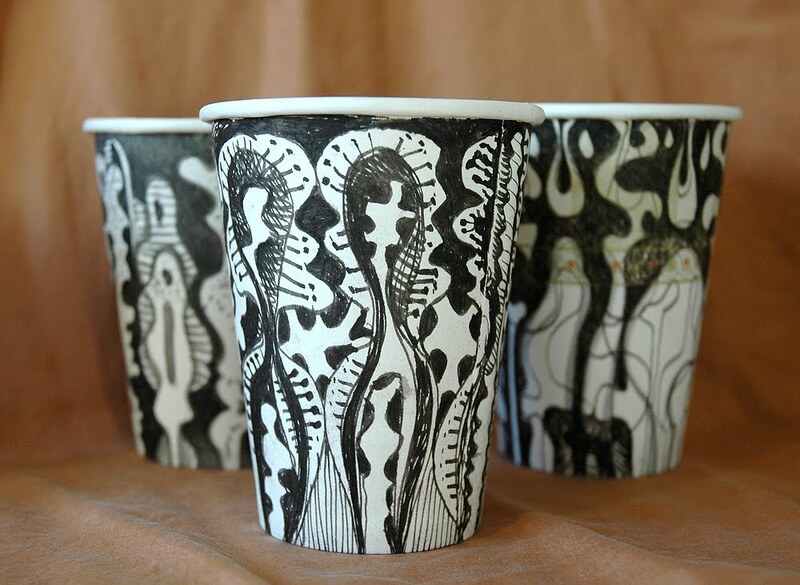 For purchase of my original cup artworks as well as photographic prints click here.